Youngberry is a complex hybrid between three different species from the genus Rubus, the raspberries, blackberries, and dewberries of the rose family. The berries of the plant are eaten fresh or used to make juice, jam, and in recipes. Byrnes M. Young, a businessman in Morgan City, Louisiana, who loved science and plants, had an ongoing correspondence with Luther Burbank, who had created the 'Phenomenal' blackberry–raspberry hybrid. Young then crossed the 'Phenomenal' with the Austin-Mayes dewberry that was better adapted to his area. This produced 'Youngberry' in 1905, which was then released in 1926. It has red coloured berries with a sweet and juicy flesh, but can not be stored for more than 3 to 4 days. While the 'Youngberry' is not grown much in the U.S., it is grown in Australia, New Zealand and South Africa and was a parent of the commercially successful olallie blackberry, and a grandparent of the marionberry. They can be grown in very fertile clay soils. Like its 'Phenomenal' parent, it is a hexaploid. Wikimedia Commons has media related to Youngberry. ^ a b c Darrow, G.M. (1955). 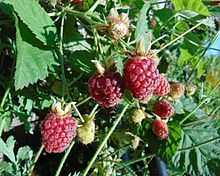 "Blackberry—raspberry hybrids". Journal of Heredity. 46 (2): 67–71. ^ a b c "Youngberry Fruit Facts and Health Benefits 101". 101healthyrecipes.com. Retrieved 29 January 2017. ^ Heally, Paul (2 November 2013). "Cane and able". organicgardener.com.au. Retrieved 29 January 2017.